This article dissects the data and analysis of men in the nursing field. Utilizing empirical evidence and verifiable data, we help students considering the field of nursing better grasp the demographics. The education insights, career tips, and data will help to inspire and educate students from coast to coast interested in learning more about the health care industry. The nursing industry is dominated by women at a ratio of nine to one. That being said, there are a number of mistruths and myths about men in nursing. In this article, we will work to dispel myths about nursing careers for men and offer resources for further discussion. During the prior two centuries, there has been a stigma associated with males entering the nursing field. Most people do not know that nursing was a male-dominated profession prior to the 1900’s. Hard to believe, but true! It was not until the early 1900’s when the pendulum of change swung to women in a significant manner. 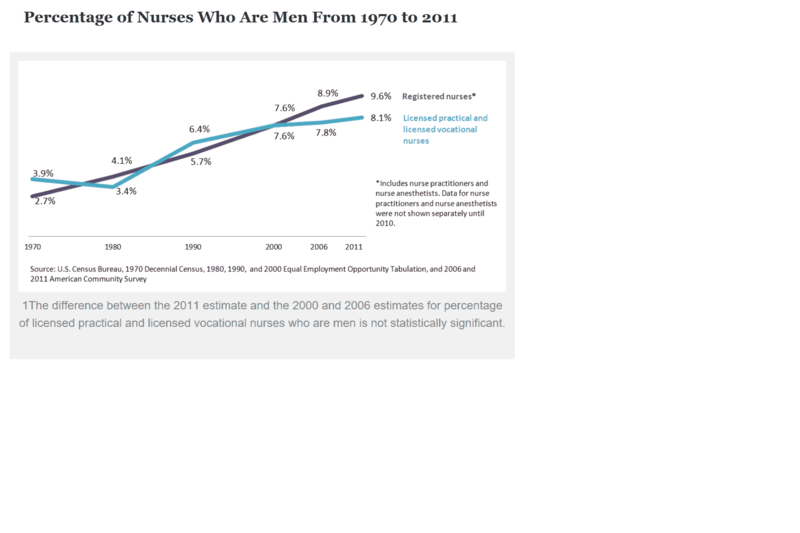 As time has passed, we are seeing a slow, steady rise in both the number and percentage of male nurses. Like women, men see the nursing profession for the myriad benefits it offers which includes the benefit of helping others, flexible work schedules, significant learning opportunities, work variety, upward mobility, and the ability to specialize. Myth #1: There are simply not enough nursing jobs for men. As we move through another generation in the United States, we are seeing the need for qualified nursing professionals in all corners of the healthcare arena. As the baby boomers continue to age and require additional care, the need for quality nurse practitioners will only continue to rise. In fact, the bulk of nursing vocations are expected to see an increase from 16-20% through 2024 according to the BLS. Myth #2: Males struggle succeeding in the nursing profession. Nursing professionals, women and men, enjoy a high level of professional respect and work satisfaction. As trends change perceptions with the passage of time, more and more people outside the medical community are seeing nursing as a viable career for men. Studies from across the country show men not only enjoy the nursing profession, but are accepted on the merits of the abilities as they enter the workforce and seek upward mobility. In fact, a recent study by MedScape shows the fact men are highly satisfied with the nursing profession and receive compensation from employers edifying the ability to thrive in a variety of professions from APN, RN, LPN and LVN. Myth #3: There simply are no male nurses. While the proportion of male nurses is small, there are plenty of male nurses. 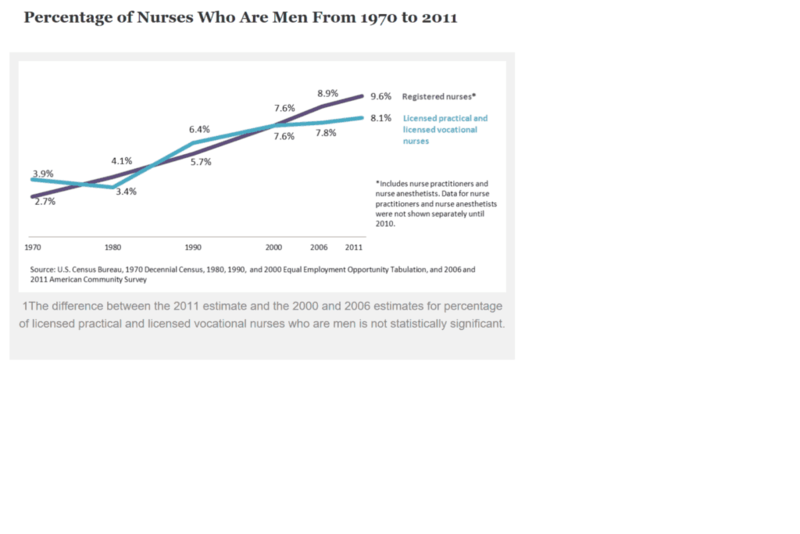 During the 1970’s and 1980’s in the United States, the proportion of male nursing professionals was around three percent and today it is hovering near 10%. As we drill a bit deeper into nursing, we can readily see pockets that dispel myths about male nurses. More specifically, the US Census Bureau published a report shows males account for 41% of all nurse anesthetics positions. Additionally, men continue to show an upward trend in participation in LPN and LVP positions growing from 3% to 8% in the last three decades. Myth #4: Nursing is not a masculine career. The Millennial generation has shown gender roles to be less and less restrictive than in previous generations and has impacted older generations accordingly. The fact remains that the innate physical strength of men can prove to be highly valuable on a team such as flight nursing, nursing rehabilitation, and medical-surgical nursing. From a self-reinforcing psychological perspective, male nurses will feel more effective in task-oriented positions where strength, calmness, and emotional stability are required. Myth #5: Women are better nurses. Mountains of data show that men and women are equally capable of creating a warm, nurturing, and healthy connection with patients and co-workers. And nursing, like many other professions within healthcare, requires professionals to effectively communicate and connect with patients. Evidence from around the country demonstrates a male nurse’s ability to possess compassion and emotional intelligence, thus providing an equal footing to be successful in the nursing profession. Emergency Room RN – An Emergency Room RN or Trauma Nurse are specialists focused on the emerging needs of an emergency room. An Emergency Room Nurse works closely with doctors, surgeons, and medical technicians. Registered Nursing or RN’s are expected to see a 16% growth with 440,000 new jobs added through 2024. To become a Registered Nurse, you must have a minimum of a bachelor’s degree from an accredited college or university. Flight Nurse – A Flight Nurse or Transport Nurse is a specialist trained to emergency care and critical care to patients while being transported to a hospital or medical facility. The median salary for Flight Nurses is approximately $75,000 with a projected growth rate of 19% through 2024. Nurse Anesthetist – A Nurse Anesthetist is also known as a CRNA or Certified Registered Nurse Anesthetist. Males comprise 41% of all CRNA nurses in the United States with a median annual income of $162,900. The BLS estimates an additional 53,400 jobs will be added in this field which equates to a growth of 31% through 2024. Professional Nurse Anesthetists do require master’s degree to enter the field. Nurse Practitioner – Nurse Practitioners are professionals that diagnose and treat episodic, acute, and chronic illness as part of a larger healthcare team. Nurse Practitioners provide education to patients, support disease prevention, and may be able to prescribe medication. A Nurse Practitioner’s earning power is significant with median annual earnings of $96,400 and approximately 136,000 professionals working in this field. Another arena where male nurses are steadily increasing is in the United States military. Within this context, males account for approximately 30% of all nurses. 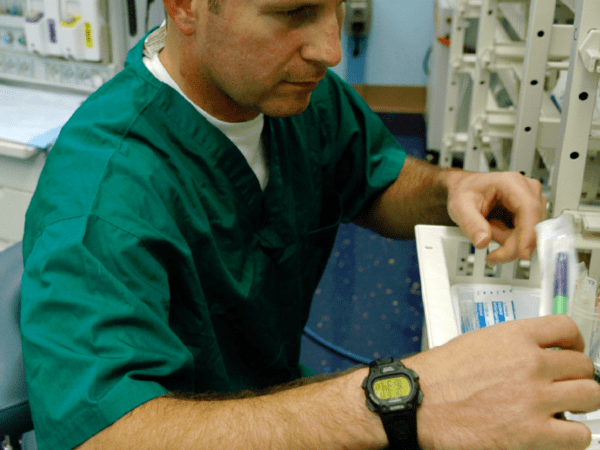 It is overtly clear why the overall numbers and percentage of men in nursing is higher in the military compared to the civilian world but a closer look may help. First, the United States military is comprised of approximately 15% females. This in and of itself will skew the overall percentage of nurses who are male. Secondly, there may be less of a stigma of male nurses in the military as the proportion of male to female is not quite as heavily weighted as the civilian model. Lastly, the military recruits individuals with specific skills and traits. The various branches of the U.S. military have become highly effective at recognizing talent and leveraging it to get the best out of each member. To make the most of your career in nursing, consider the following action steps to better understand the profession, network, and establish yourself in the field.